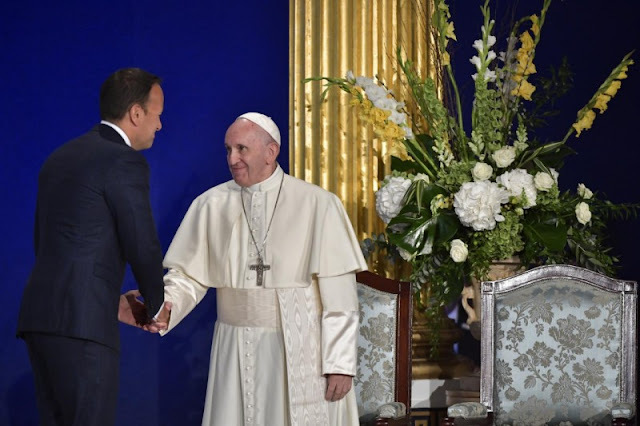 At the beginning of my visit to Ireland, I am grateful for the invitation to address this distinguished assembly representing the civil, cultural and religious life of the country, together with the members of the diplomatic corps and guests. I appreciate the friendly welcome I have received from the President of Ireland, which reflects the tradition of cordial hospitality for which the Irish are known throughout the world. I likewise appreciate the presence of a delegation from Northern Ireland. I thank the Taoiseach for his words. The Gospel reminds us that true peace is ultimately God’s gift; it flows from a healed and reconciled heart and branches out to embrace the entire world. Yet it also requires constant conversion on our part, as the source of those spiritual resources needed to build a society of authentic solidarity, justice and service of the common good. Without that spiritual foundation, our ideal of a global family of nations risks becoming no more than another empty platitude. Can we say that the goal of creating economic or financial prosperity leads of itself to a more just and equitable social order? Or could it be that the growth of a materialistic “throwaway culture” has in fact made us increasingly indifferent to the poor and to the most defenceless members of our human family, including the unborn, deprived of the very right to life? Perhaps the most disturbing challenges to our consciences in these days is the massive refugee crisis, which will not go away, and whose solution calls for a wisdom, a breadth of vision and a humanitarian concern that go far beyond short-term political decisions. I am very conscious of the circumstances of our most vulnerable brothers and sisters – I think especially of those women and children who in the past endured particularly difficult situations, and to the orphans of that time. With regard to the most vulnerable, I cannot fail to acknowledge the grave scandal caused in Ireland by the abuse of young people by members of the Church charged with responsibility for their protection and education. I was deeply moved by the words spoken to me by the Minister for Children and Youth Affairs; I thank her for those words. The failure of ecclesiastical authorities – bishops, religious superiors, priests and others – adequately to address these repellent crimes has rightly given rise to outrage, and remains a source of pain and shame for the Catholic community. I myself share those sentiments. My predecessor, Pope Benedict, spared no words in recognizing both the gravity of the situation and in demanding that “truly evangelical, just and effective” measures be taken in response to this betrayal of trust (cf. Pastoral Letter to the Catholics of Ireland, 10). His frank and decisive intervention continues to serve as an incentive for the efforts of the Church’s leadership both to remedy past mistakes and to adopt stringent norms meant to ensure that they do not happen again. More recently, in a Letter to the People of God, I reaffirmed the commitment, and the need for an even greater commitment, to eliminating this scourge in the Church, at any cost, moral and of suffering.